Voice actor Erik Todd Dellums says the world may not have seen the end of the wasteland's favorite DJ. He's your friendly neighborhood disc jockey! What's a disc? Hell if he knows, but there's a chance he's going to keep talking anyway in Fallout 4, or whatever the next release in Bethesda's hit post-nuclear RPG series ends up being called. "To all my #Fallout3 and #ThreeDog fans: There may be more of the Dog coming! Fingers crossed!" he recently wrote on Twitter. Giving a touch of official-sounding heft to the pronouncement, he added, "How was that for a tease! I was given permission to release that tease, so fingers crossed." I won't pretend that it's even slightly surprising that a new addition to a popular, multi-million-selling videogame franchise is in the works, but the potential presence of Three Dog certainly is. 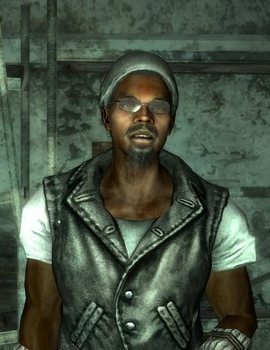 It's not hard to understand why Bethesda would want him involved - Three Dog was one of the highlights of Fallout 3 - but getting him in there in a way that doesn't come across as horrible awkward and contrived will be quite a trick.